A day has passed since April and the Turtles helped Man Ray bury his friend, Bubbla the Glublub. They remain stranded on a South American beach, hoping in vain that Man Ray’s aquatic telepathy can summon some humpback whales for them to ride back to civilization. 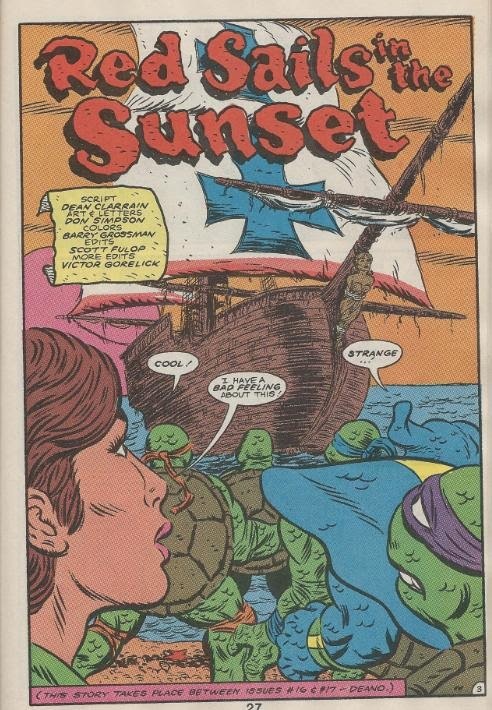 As the Turtles prepare a fire, a derelict 17th century English pirate ship suddenly appears on the horizon. The gang decides to check it out and find the rickety ship festooned with pirate skeletons. Entering the Captain’s quarters, Raph’s gaze is immediately drawn to the chest of booty laying amidst a pile of bones. April, however, immediately notices a note in a bottle. The note reads, “Lift the curse by freeing the lady and letting the sands of time wash over her”. Raph pays no mind to this ominous warning and opts to open the chest, anyway, releasing the entrapped spirits of all the dead pirates. 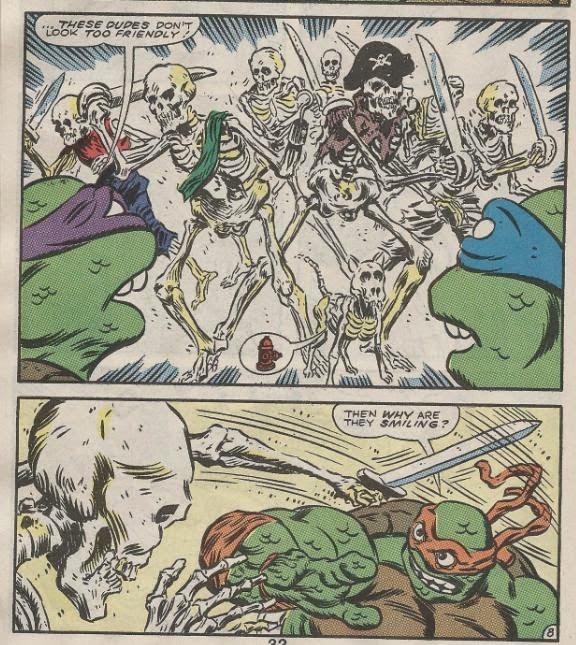 The skeletons burst to life and attack the TMNT, who struggle with defeating a foe that cannot die no matter how many times they stab them. April and Man Ray, however, opt to search for a more permanent solution and scour the ship for “the lady”. They eventually find her as the figurehead on the ship’s mast. A swordfight between Leo and the pirate Captain results in the lady being chopped free from the mast, allowing April and Man Ray to bury her in the sand on the water line of the beach (so the “sands of time” could “wash over her”, you see). As soon as this is done, the pirates and their ship dissolve into dust, sending the startled Turtles plummeting into the water. Not pleased with the mess caused by Raph’s stupidity, the Turtles quickly lock him up inside the empty treasure chest, ignoring his protests for release well into the night. *This story takes place between TMNT Adventures #16 and TMNT Adventures #17. *Bubbla the Glublub was killed by Kid Terra in TMNT Adventures #16. 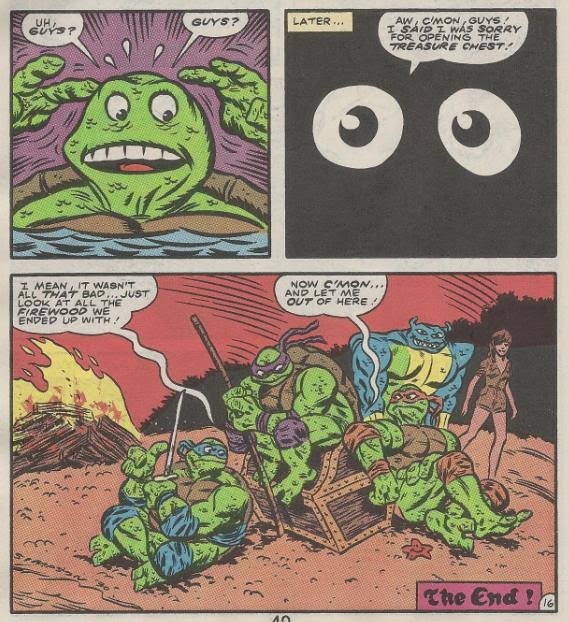 *This story was reprinted in TMNT Adventures #72. Well, Don Simpson’s back. Hooray? He had previously appeared as a fill-in artist for TMNT Adventures #14 and I made my assessment of his style pretty clear in my review for that issue. He draws the Turtles as being very bumpy and deformed and offensively ugly for some utterly bizarre reason. While his action layouts are all quite good and I dug his work on the skeletal pirates, it’s hard to get by the character designs for the Turtles being so overbearingly hideous. As for the story, well, the opening narration from April set a somber tone I was hoping would follow through the rest of the tale, but was dumped after the first page for a fairly goofy adventure. Bubbla the Glublub had the misfortune of dying in his very first appearance and we’re rarely given the sight of Man Ray mourning over Bubbla’s demise; mostly he just gets angry at Kid Terra for murdering him. A moment of tragic reflection would’ve done wonders for making their “super duper friendship” feel a bit more convincing, as all we really have to go on for that is face value whenever Man Ray assures us that they were awesome buddies. “Red Sails in the Sunset” boasts a very dramatic title ascribed to a rather typical adventure (pirate skeletons and ghost ships; yawn). If you’re into Don Simpson’s art style then you probably won’t have the same unenthusiastic-bordering-on-negative reaction that I did. If Simpson’s ultra-ugly take on the TMNT isn’t your thing, though, then this’ll mostly stand as a fairly forgettable tale.